Meet the Staff at Liberty Motors Inc.
Ken Madole and his sons Seth and Spence Opened Liberty Motors Inc. on Aug. 1st 2001 from day one our goal has been at the moment you step on our lot until the time you drive away in your next car, your buying experience with Liberty Motors Inc. has been our number one priority. We encourage you to use the expertise and resources of our sales staff; they are here to help you find the right car at the right price. Call us today at 319-665-6080 to schedule your test drive! 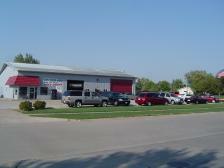 Ken has been in the car business for over 40 years, he has lived here in North Liberty for the last 35 years. Ken is married to Dell Madole, they have been married for over 37 years and they have two sons Seth and Spence Madole who are also co-owners in the business. Spence has lived in North Liberty his entire life and doesn't plan on going anywhere, he is married to JoAnna Droll-Madole, they have been married for the last 5 years, they have two sons Collin 4 and Connor 2. Spence has been in the car business for the last 14 years.